Have you ever felt a weird vibration coming from your steering wheel when you're cruising along the highway or your car shaking when you pick up speed? Or perhaps you've noticed that your tires are wearing out faster than usual. If so, you may be seeing the results of imbalanced wheels, which could make for a rough ride and can have some dangerous and expensive side effects. Between your tires and wheels, there is a strip of weights that line the inside of the wheel, a part that goes unnoticed by the average driver. Over the life of your wheels, these weights that are initially evenly distributed around the wheel's circumference will begin to shift, which causes an imbalance in the wheel. This imbalance could be along the horizontal plane of the wheel, which would cause side-to-side vibration, or it could be concentrated in certain spots (either too heavy or too light) on the tire, making for turbulent forward rotation. 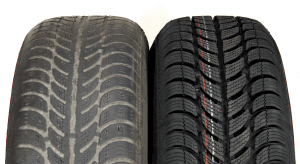 This could lead to a downgrade in traction and/or shifting, as well as accelerated tread wear, which can have you buying new tires sooner than you might have expected. While it is possible to balance your wheels yourself, it is much more efficient and precise to take your car to a garage or dealership with professional equipment and machinery. Here, your mechanic will remove the wheels from your car. One-by-one, they will fix them securely to a wheel balancing machine that spins rapidly to gauge where the imbalances are in the wheel. Once the machine is able to read where the weight needs to be distributed, the mechanic will then replace the weights on the inside of the wheel and repeat the process for the remaining wheels to be balanced. It's important to note that imbalanced wheels may not be the only cause to the shaking or vibrating felt in your car while driving. Bent wheels and uneven tread wear can also make for a bumpy ride, and for these issues, you may need new tires altogether.